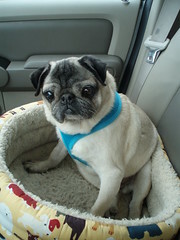 Four years ago, a sick pug came into pug rescue. I got to witness his journey through the medical procedures and his recovery via a fellow foster home. We were only supposed to be baby sitting him for a little while, but I had loved him from the first time that I laid eyes on him. We adopted Theodore from SEPRA and he immediately became our Teddy Bear. 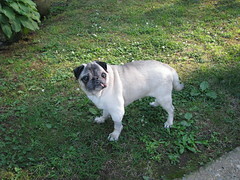 He was quiet honestly the worst pug ever-pee’d on everything, woke up at 3:30am to eat breakfast, hated all other pugs (especially other males), was a bundle of medical problems, and I could go on. But he was also the best pug that I have ever known-just one look from his big brown eyes and I would melt into his every command. I never understood what a heart dog was until I met him. Sadly, over the past couple of months, he started having seizures. We had a rough go of it on Friday night and ended up at the emergency vet. He seemed to do a little better on Saturday and even on Sunday. Something changed on Monday though. When I got home from work and he did not have the motor skills to eat, I knew in my heart that it was time. I snuggled in the bed with him and cried. I had to continually give him Valium through out the night to fend off the tremors. Today is was the end of his journey. We took him to the vet’s office and did the hardest thing; to let him go. I am deeply saddened by this loss, but relieved that his body is no longer torturing itself. Once again, my pug friends and fellow rescuers have rallied at my side to offer condolences, hugs, prayers, and well wishes. I thank you all from the bottom of my heart. No, really, it is the ‘Ultimate Belly Band!’ For those of you who do not have male dogs or have male dogs that are potty trained, then you many not be familiar with belly bands. The rest of us could not survive a day with out them! It was time to order Teddy some more belly bands and I decided to splurge and get his name monogrammed on it. It arrived in the mail today!!! Look how cute he looks sporting his new look! Bev provides a great product with the design, construction, and style! You won’t be disappointed! Or you can contact Bev at ultimatebellybands@comcast.net for a selection of fabrics, pricing, etc. She is wonderful to work with and you will be very happy. The plus side of the recession is that I ordered a monogrammed bed for Teddy with a matching blanket on Monday and it arrived by Friday. The website says estimated delivery 2-3 weeks. Which in my mind is 14-21 days, but my order got here in only 5 days! 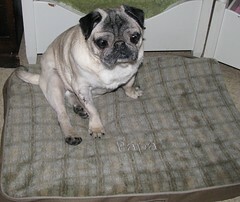 I have been looking for Teddy a durable, washable, orthopedic bed for awhile and finally found one that fit the bill. The ironic thing is that I have the matching bag and did not even realize it. As soon as I put the bed down, all of the pug had to check it out and give if the comfort test. I believe it has passed. I think that I might even order another, bigger one for ALL the pugs to share. First of all, I live no where near Milwaukee and can barely even spell it, but their contest benefits pug rescue so I had to enter. 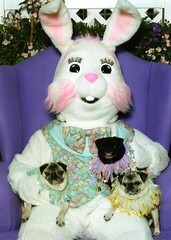 The contest was spotlighting Senior Pugs. 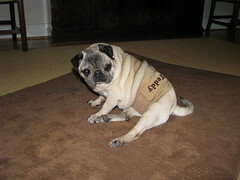 The winning page will get a $250.00 donation to the pug rescue of their choice. Well, I probably spent more than 250 in supplies, time, and postage for the pages that I submitted. I went to about 6 different stores looking for a recordable greeting card. I had an idea to add music to Teddy’s page, and I had just about given up until I finally found a card where you can record your own message! I think that I did a pretty good job on my pages and hope that I (SEPRA) wins! You have to turn up the volume so you can hear Elvis’ “Teddy Bear”. You are currently browsing the archives for the Teddy category.